So, you have a passion for good wine… You know what you like. 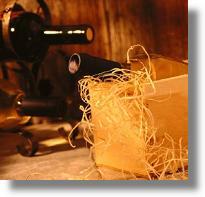 You have developed an understanding towards the myriad of qualities, complexities, and attributes that structure a wine. You may now purchase in quantity and, perhaps, have begun to build a collection. One thing remains certain, however. To store and age your precious selections for any length of time, you are going to require a wine cellar. And, there is nothing quite like passing through the doorway to your own, private wine sanctuary. The cool air of the cellar washes over you. You inhale the pleasant fragrance of the hard wood racking. It is a place to ponder…to appreciate…a place you can call all your own. I have studied wine cellars for quite some time, and one thing remains clear. There are a number of ways to build a cellar correctly, but there are a huge number of mistakes that you can make…mistakes that will come back to haunt you down the road. You have the choice to pay a professional to install your cellar for you, which can get very expensive very quickly. Or, you can tackle the project yourself. If you do decide to take on this daunting endeavor personally, be sure to do your research! As I recently opened my own retail wine store, I ended up with a large amount of experience setting up the racks. Take a look at my photo gallery of the racks I built and please leave a comment if you have any questions on to get started. Glad I found your blog! I have a post on my own called Wine Cellars on a Shoestring, if you want to take a peek, for those of us who can’t quite afford the real deal. Thanks for stopping by, swirlingnotions. I dropped by your blog as well to check out your article on wine cellars…great job!